Misnamed planet "Earth" is not the only planet in the solar system with water. "Earth" is often thought to have two sister planets, Venus and Mars. Yet the water on these sister planets is not at all like water on Earth. The surface of Venus cannot be seen through its thick, hot, acid cloud atmosphere. The only pictures from Venus' surface were taken from Russian spacecraft/landers in the 1970s. These images show broken basaltic rock, under an atmosphere about 1000 times heavier than on Earth, maintaining a surface temperature higher than 700 °C. Even at such pressure, all water on Venus occurs as gas, mixed with the mainly CO2 atmosphere. Mars tells a different story. So far as is known, the only water on Mars surface occurs as ice, with traces of water vapour in Mars' thin, cold atmosphere. 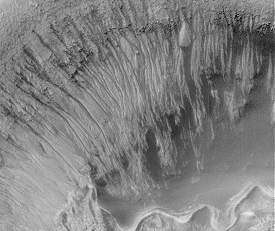 But was Mars always so cold and dry? Features that look like drainage channels occur in many regions. Were these carved by Martian rivers flowing into ancient Martian seas on a warmer, moister Mars? If so, what happened? There is another water-world in the Solar System, one that might be especially interesting. It is not a planet but is the moon Europa circling giant Jupiter. Europa appears to be completely covered with ice, and only a trace of atmosphere. Europa seen from afar. Up close the icy surface is fractured from impacts and from tides. Yet magnetic fields generated within Europa suggest a moving saltwater sea underlying Europa's icy crust. The sea may be warmed from heat generated within the Europa interior due to straining under tidal forces of mighty Jupiter. This presents the possibility, perhaps remote or bizarre, that hot venting at the base of Europa's ice-covered seas may support life -- as also seen near deep sea vents on our own Planet Water.